X-linked ocular albinism type 1 (OA1) is caused by mutations in OA1 gene, which encodes a membrane glycoprotein localised to melanosomes. OA1 mainly affects pigment production in the eye, resulting in optic changes associated with albinism including hypopigmentation of the retina, nystagmus, strabismus, foveal hypoplasia, abnormal crossing of the optic fibers and reduced visual acuity. Affected Caucasian males usually appear to have normal skin and hair pigment. We identified three previously undescribed mutations consisting of two intragenic deletions (one encompassing exon 6, the other encompassing exons 7–8), and a point mutation (310delG) in exon 2. We report the development of a new method for diagnosis of heterozygous deletions in OA1 gene based on measurement of gene copy number using real-time quantitative PCR from genomic DNA. The identification of OA1 mutations in families earlier reported as families with hereditary nystagmus indicate that ocular albinism type 1 is probably underdiagnosed. Our method of real-time quantitative PCR of OA1 exons with DMD exon as external standard performed on the LightCycler™ allows quick and accurate carrier-status assessment for at-risk females. Congenital nystagmus (CN) is the common symptom of a range of diseases involving the macula from infancy on, and includs at least three X-linked disorders: Nettleship-Falls ocular albinism type 1 (OA1; MIM#300500) mapped to Xp22.3, complete congenital stationary night blindness (CSNB1; MIM#310500), mapped to Xp11.3 and blue-cone monochromatism (CBBM; MIM#303700), mapped to Xq28. These genetic disorders must be distinguished from the congenital motor nystagmus (CMN), a hereditary disorder characterized by bilateral ocular oscillations which occurs in the absence of any apparent ocular disease . Diagnosis of the underlying disease often requires extensive clinical and electrophysiological examinations. Prevalence of OA1 is estimated around 1 in 50,000 live births in Caucasian populations. The most frequent findings in hemizygous individuals with OA1 are foveal hypoplasia, hypopigmentation of the retina and iris translucency together with normally pigmented skin and hair . The disease typically results in severely impaired visual acuity in affected males who also manifest variable strabismus, photophobia, and misrouting of optic pathway. The size, shape and number of melanocytes are normal in the skin, hair follicle and retinal pigment epithelium in OA1 patients, but they contain (although not specifically) variable proportions of giant melanosomes . In spite of a well-defined clinical presentation, a few individuals initially misdiagnosed with congenital nystagmus have been shown to be affected by ocular albinism type 1 by screening the OA1 gene [3, 4]. We report on three additional white OA1 unrelated families, with a total of fourty seven individuals, which were initially referred to our laboratory for congenital nystagmus. The aim of the study was to elucidate the molecular genetic defect responsible for the phenotype and to define a reliable strategy to assess the genetic status of at-risk females. Analysis of X-linked markers in the two pedigrees (OA1-1 and OA1-2) initially reported as familial cases diagnosed with X-linked congenital nystagmus was consistent with an association between the affected phenotype and the OA1 locus, as exemplified in Fig. 1 for a microsatellite in OA1 intron 1. OA1 gene was then extensively screened, and the disease-causing mutation could be identified in the three families reported in this study. Pedigrees initially referred for congenital X-linked nystagmus.Black squares are for affected males, small solid circle within open circles for obligate carrier females, open symbols for non affected individuals. ? : undefined clinical status prior to doing molecular study. Numbered individuals are those in whom molecular investigation of the OA1 gene was performed. Results of the OA1-CA microsatellite analysis are given in families OA1-1 and OA1-2 as indicated by alleles A, B, C, or D.
The OA1 gene was then examined for mutations, and we detected one deletion encompassing exons 7–8 (pedigree OA1-1), and one deletion encompassing exon 6 (pedigree OA1-2). The amplification failure was shown to be specific for this portion of the OA1 gene by using duplex-PCR. In pedigree OA1-1, exons 7 and 8 were co-amplified with OA1 exons 9 and 6, respectively (Fig. 2A). In pedigree OA1-2, exon 6 was co-amplified with OA1 exon 9 (Fig. 2B). Moreover, the single exon 6 deletion was confirmed using alternative primers to exclude possible sequence changes in primer annealing sites. Detection of OA1 intragenic deletions in males. 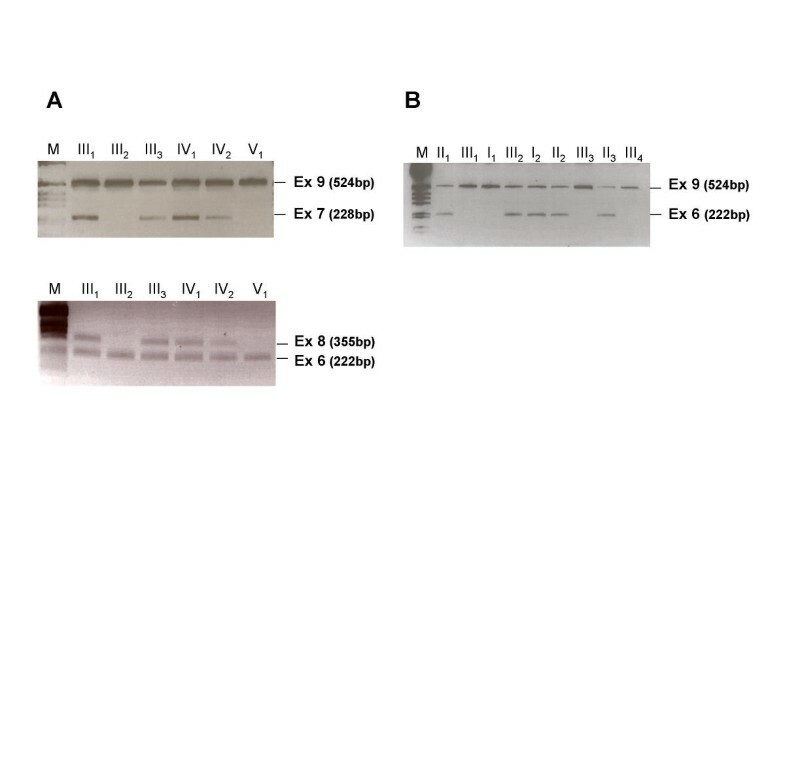 (A) Exon 7 (top) and exon 8 (bottom) failed to amplify in two affected males III2 and V1 from family OA1-1 while the two exons amplified normally from DNA obtained from unaffected individuals (III1, III3, IV1) and a female carrier (IV2). As internal control, exon 9 of the OA1 gene has simultaneously amplified from the DNA samples of family members. (B) A deletion of exon 6, using primers 6H6F and 6H6R , was detected in the proband III1 of family OA1-2. The deletion of exon 6 was found in all affected individuals of the family (I1, III1, III3, and III4). Alternative primers were used to confirm the deletion (data not shown). M: molecular weight marker, one kilobase ladder, Gibco BRL. As heterozygous deletions are not detected by conventional PCR, assessment of genetic status in females was performed by using two complementary strategies. A highly polymorphic dinucleotide repeat OA1-CA located within intron 1  was used for carrier testing in both families. 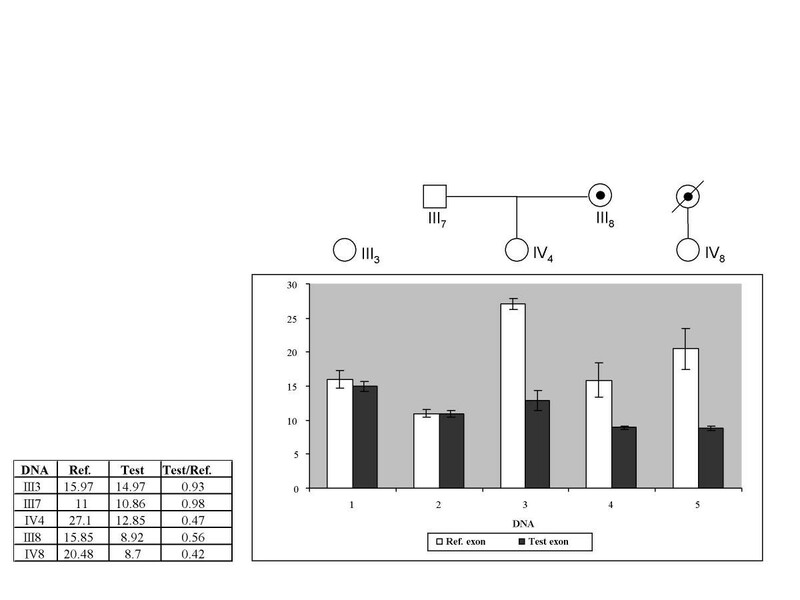 Segregation analysis using the OA1-CA marker in the family OA1-2 showed that the sister (III2) of the affected individuals had inherited the maternal allele (A) that has been transmitted to the affected males (Fig. 1), thus indicative of the sister to be a probable carrier of the exon 6 deletion in the OA1 gene. In family OA1-1, the analysis of marker OA1-CA revealed full cosegregation between one allele (B) of the dinucleotide repeat and the disease (Fig. 1), which allowed to exclude one at-risk female (IV9) of being a carrier. Indirect analysis was not able to elucidate the carrier status of two other females IV4 and IV8 in family OA1-1. We therefore developed a quantitative test for detection of heterozygous deletions on the basis of real-time PCR on a LightCyclerTM instrument. The method involves amplification of an exon included in the deletion (OA1-exon 8) and normalization of genomic template by analyzing a reference locus with known copy number. We used a fragment (exon 4) of the DMD gene as reference locus because it yielded previously highly reproducible amplification results. Heterozygosity for a deletion is expected to reduce the gene dose from two to one in carriers. We detected an OA1-exon 8/DMD-exon 4 ratio of 0.56 in female III8, thus confirming the presence of the heterozygous deletion of exon 8 in this obligate carrier, while the female and male controls showed a ratio of approximately 1.0 (0.93 and 0.98, respectively) (Fig. 3). Gene dosage analysis in the two females IV4 and IV8 whose carrier status was previously undefined clearly established that they were both carriers of an exon 8 deletion (OA1-exon8/DMD-exon 4 ratio of 0.47 and 0.42, respectively). Real-Time Fluorescent PCR Gene Dosage Test. Segregation of the deletion of exons 7–8 in pedigree OA1-1 was demonstrated by quantitative screening using the Light Cycler™ technology. Results of dosage of the DMD-exon 4 (reference locus) and OA1-exon 8 (test locus) are shown on the histogram (white bars and grey bars, respectively). Each DNA sample was run in quadruplicate. Errors bars indicate standard deviation. Mean values of dosages and ratios [OA1-exon 8 (test) DMD-exon 4] are given in the Table. Lane 1, normal control female; lane 2, normal male; lane 4, obligate carrier of the exons 7–8 deletion (ratio test/ref of 0.56). Lanes 3 and 5, females IV4 and IV8 (with undefined status initially) showing a heterozygous deletion of OA1-exon 8 indicated by ratios of approximately 0.5. In the index patient (IV1) of family OA1-3 that did not show exon deletion, sequence analysis of all coding exons including the exon-intron boundaries revealed a deletion of a single nucleotide G at position 310 of the cDNA introducing a subsequent premature stop codon one codon downstream, predicting a deleterious protein product. This newly described mutation (310delG) in exon 2 of the OA1 gene creates a TaqI restriction site. 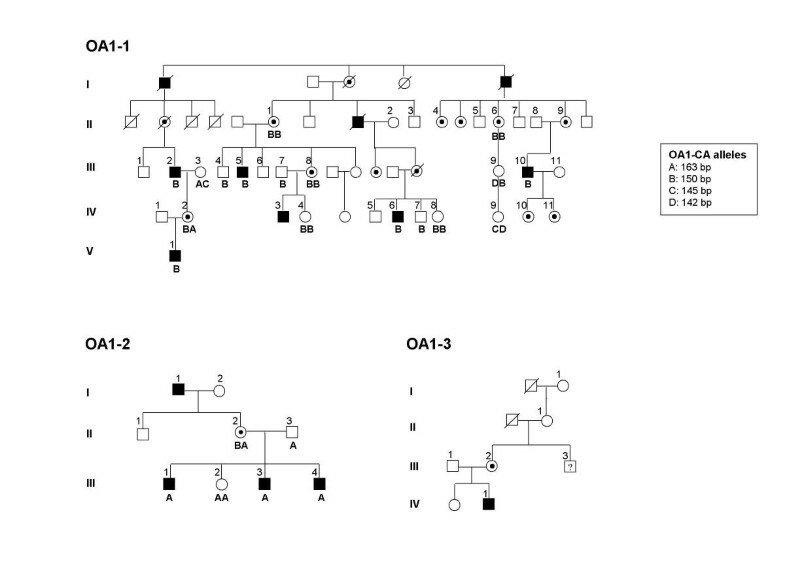 Although the pedigree of family OAI-3 initially suggested the patient IV1 to be a sporadic case, PCR-restriction analysis identified the patient's maternal uncle (III3), known to have only a decreased visual acuity at age 38, as hemizygous for the mutation. The mother (III2) and the maternal grand-mother (II1) of the proband were found to be carriers (Fig. 4B), as expected, while the great-grandmother (I1) showed a normal pattern of PCR restriction, which is indicative either of a de novo mutation in her germline or inheritance of the mutation from her deceased husband. Caracterisation of the 310delG mutation in the family OA1-3. (A) Direct sequencing of the OA1 gene exon 2 showing a one-bp deletion in the index case (bottom) compared with the wild-type sequence (top). (B) Familial segregation of the 310delG mutation is illustrated by restriction analysis. 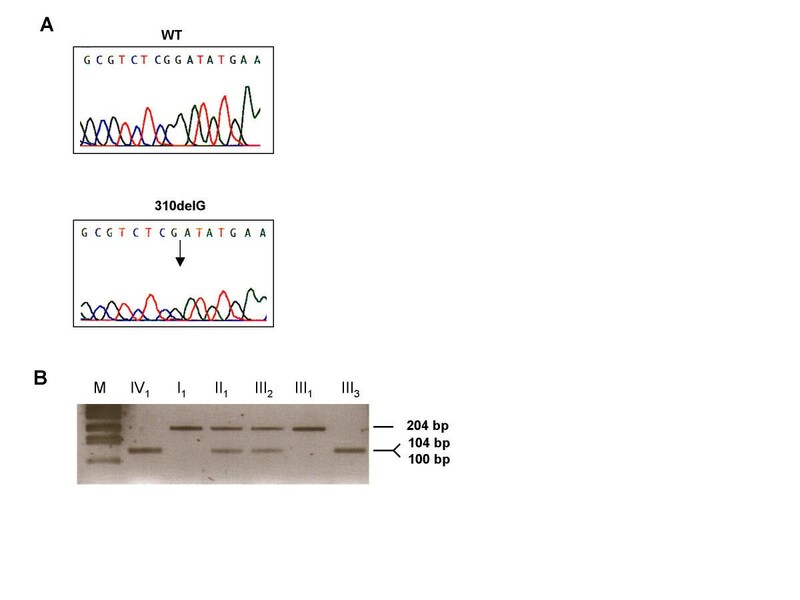 The mutation creates a new restriction site for TaqI, which cleaves the 204-bp exon 2 PCR product into two fragments (104 and 100 bp) in III3 and IV1, showing a heterozygous pattern in the carrier females II1 and III2. M: molecular weight marker, one kilobase ladder, Gibco BRL. The three mutations reported here have been found in patients who were initially misdiagnosed with congenital nystagmus when they where examined first. Our observation is in agreement with previous report by Rosenberg and Schwartz. who stated that ocular albinism type 1 is underdiagnosed and pinpoints the fact that the clinical investigation of patients in specialized consultation may be required for accurate and differential diagnosis of OA1. The female carriers are usually asymptomatic, but have been reported to exhibit punctuate areas of iris transillumination defects and a characteristic mottled appearance of the retinal pigment epithelium resulting from Lyonisation . Also, the identification of macromelanosomes on skin biopsy can be useful for supporting the diagnosis and identifying carriers eventhough it is not a specific and obligate criteria . However, if clinical examination will detect approximately 70 % of carrier females, it will not allow reliable genetic counselling for all at-risk females because of the variability in clinical manifestations. Reliable carrier determination can be achieved by molecular studies as presented in this study. It relies on different molecular approaches depending on the familial history (familial versus sporadic cases) and the type of the mutation (point mutation versus large deletions). In familial cases with unidentified OA1 mutations, indirect approach based on linkage analysis using microsatellites may be of help but requires extensive familial DNA analysis and may be unconclusive in some individuals. Direct testing of previously characterized point mutations in at risk females can be performed either by direct sequencing or by scanning methods such as DGGE (Denaturing Gradient Gel Electrophoresis) or dHPLC (denaturing High Performance Liquide Chromatography), although these methods may be more technically difficult to set up. For detection of intragenic deletions in females, Southern blotting is not the method of choice as it is time-consuming, radioactive, and as estimation of gene dosage by measuring the intensity of probe hybridized is not accurate enough. The real-time fluorescent PCR gene dosage assay that we have developed in this study is an accurate, non radioactive and fast method for gene carrier assessment that can be applied to any type of OA1 gene deletion. Affected males in pedigrees OA1-1, OA1-2, and OA1-3 were initially diagnosed with congenital nystagmus inherited in an X-linked pattern, and blood samples from 47 individuals were referred to our laboratory for genotyping in the purpose to identify the genetic interval with which a putative gene could be located. Blood samples were taken from patients and available family members after informed consent, and genomic DNA was isolated by standard techniques. All individuals were Caucasians originating from South of France. Congenital nystagmus was diagnosed in individuals IV3 in pedigree OA1-1, I1, III1 and III3 in pedigree OA1-2 and IV1 in pedigree OA1-3 following routine ophthalmological examination. The patients had normal hair and skin pigmentation. There was no photophobia or nyctalopia. After identification of a mutation in the OA1 gene, clinical signs were re-evaluated. Kinetic visual fields were determined in a Goldman perimeter with targets V4e, III4e, et I4e. Full-fields ERG was recorded using a ganzfeld apparatus (Metrovision, France) with a bipolar contact lens electrode on maximally dilated pupils. Ophthalmological examination revealed signs consistent with ocular albinism type 1 in all affected males re-examined. In family OA1-1 the affected male IV3, aged 10 at the time of presentation, had a visual acuity of 30/200 in RE (+2.50 sph/+1.50 cyl A 70°) and 40/200 in LE (+2.50 sph/+1.00 A 180°). At slit-lamp examination there was no abnormality of the iris pigmentation and the lenses were transparent. The fundus revealed a patchy aspect of the pigmentation in peripheral retina with some areas of hypopigmentation. There was a foveal hypoplasia that was confirmed by the absence of the normal afluorescence of the macula. In family OA1-2, the 9-year old proband III4 had a visual acuity of 40/200 in both eyes. Slit-lamp examination revealed retroillumination of the iris periphery. The lenses were transparent. Fundus examination showed a slight depigmentation with moderate foveal hypoplasia. The 44 year-old mother (II2) who was also examined had 20/20 of visual acuity in both eyes and normal iris pigmentation; however, fundus examination revealed a patchy pigmentation at the posterior pole and numerous, low contrasted gray dots in the mid periphery of the retinas. The apparently sporadic case IV2 in family OA1-3 had, at 26 years of age, a visual acuity of 30/200 in both eyes with RE (+3.00 sph/3.50 cyl A 180°) and LE (+4.25 sph/2.75 cyl A 180°). Slit-lamp examination revealed a spoke like atrophy of the iris with retroillumination. The lenses were transparent and the intraocular pressure was 14 (RE) and 15 (LE). Fundus examination showed a radial pattern of hypopigmentation that spared the macula. There was foveal hypoplasia with some retinal vessels that crossed the macular area, confirmed by the absence of the normal afluorescence of the macula. ERG recording of the mixed rod-cone response was in the normal range but the rod response was slightly diminished and the cone response (30-Hz flickers) was markedly diminished. Skin biopsy was unavailable for any patient at the time of the study. X chromosome marker set (Panel 28) from the ABI PRISM Linkage Mapping set MD-10 (Applied Biosystems) was used. Markers were amplified from genomic DNA, according to methods specified by the manufacturers. PCR products were loaded onto an ABI 377 automated sequencer, and data were analyzed by ABI GeneScan 3.5 and Genotyper softwares. All nine exons of the OA1 gene and part of the flanking introns were PCR-amplified from genomic DNA using the primers described by Schiaffino et al. , with some modifications. A new forward primer was used for exon 3 amplification (5'-TGACCTTTCCAGAGCGCAG-3'). Also, new primers were designed to confirm the single exon 6 deletion in family OA1-2 (forward 5'-GCCTTGCTTGTGGGCTCACA-3'; reverse 5'-TCAAAGGGCACCTAGCACAGTCT-3'). PCR products of the 9 exons were sequenced on both strands using the BigDye terminator cycle sequencing kit (Applied Biosystems, Foster City, CA) and analyzed on an ABI 310 automated sequencer with the sequence analysis software, according to the manufacturer's protocols. The PCR products were digested with 10 units of the appropriate restriction enzyme, resolved on NuSieve agarose gels, and visualized with ethidium bromide. The dinucleotide repeat sequence was amplified using primers and PCR conditons previously described . Fluorescent PCR products were analyzed on an ABI 310 automated sequencer. The quantification was performed with a LightCycler instrument (Roche Diagnostics) using SYBR Green I for online measurement of PCR products. The method involves amplifications of a test exon located within the deleted region (OA1 exon 8) with unknown copy number and a reference locus (exon 4 of the X-linked DMD gene) with known copy number. Using standard curves, the copy number of the test DNA relative to a common standard DNA is determined for each locus. From the ratio of the relative copy numbers, the genomic copy number of the test locus is determined. In each assay, 3 family members, 2 normal controls (male and female), and a no-template control (background) were included. Each sample was run in quadruplicate. The PCR was performed in a total volume of 20 μl, containing 4 pmol of each primer, 2 μl of Faststart DNA kit SYBR Green I, 5 mM MgCl2. The reactions were cycled 45 times with a 95°C denaturation for 15 sec, a 55°C (OA1 exon 8) or 65°C (DMD exon 4) annealing for 5 sec, and 72°C extension for 10 sec (DMD exon 4) or for 15 sec (OA1 exon 8). The primer sequences for OA1-exon 8 and DMD-exon 4 have been previously described [5, 13]. This quantification program was followed by a melting program for every PCR product for each sample. Quantification data were analyzed using the fit points method of the LightCycler software. VF carried out the molecular genetic studies. STG conceived the real time quantitative PCR. CH collected the clinical data. MC coordinated the study. The authors express their gratitude to SOS-Rétinite France for their support to this study.